In world terms the humble potato (Solanum Tuberosum) is the third most important food crop coming after only rice and wheat. And this is despite the modern highly bred potato being rather delicate compared with its robust Andean forebear. In the light of today's increasing world food shortages, the United Nations has recognised the important future role that the potato can play in helping to feed the world. It has declared 2008 as the Year of the Potato. See www.potato2008.org. One of the aims is to breed new varieties that are more pest and disease resistant and are suitable for growing where the potato is not already widely cultivated. 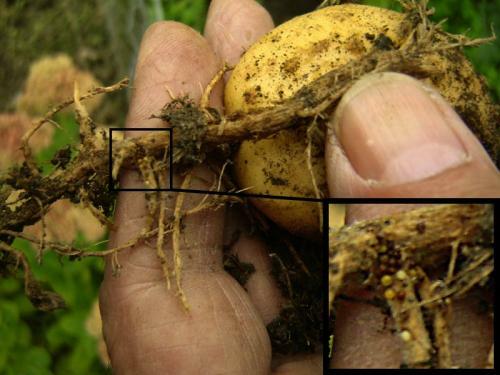 The potatoes that we grow suffer from a host of problems, some of which are Blight, various Viruses, Blackleg, Frost damage, Hollow Heart, Soft Rot, Spraing, Scab, Wart Disease, Slug and Wireworm damage and Potato Cyst Nematode (PCN) damage. The tight control and careful selection of commercial seed potato growing now mean that some of these problems are, to an extent, under control. But the pest that this article is concerned with is present on most allotment plots and is particularly insidious because, unlike most of the other problems, it is not easily recognised without a bit of knowledge and a magnifying glass. Eelworm, or Potato Root Eelworm, are the common names for the Potato Cyst Nematode. The tiny eelworm itself is visible only with a microscope and even that is difficult since it lives inside the roots of the plant. The visible indications of an attack are often put down to other factors such as poor seed, poor season, poor soil, and lack of water. These indications are early yellowing and die back of the haulms with a poor crop of small potatoes. The problems become worse as crop follows crop. One sure method of identifying an eelworm attack is to look for the tiny egg bearing cysts on the roots at harvest time. The photo accompanying this article shows quite a serious problem with at least three dozen cysts on just a few bits of root. By the late stage of the season when this photo was taken, many other mature cysts had almost certainly fallen off into the soil. The cysts live for seven or more years and "wake up" when they detect the roots of another potato. They each then release several new eelworms which enter the roots to repeat their cycle. The main concentration shown in the photo is at the end joint of my forefinger with at least twenty cysts in the space of about half an inch. They are mostly brown but there are also some white and yellow/orange ones. The potato itself was still perfectly safe to eat. The grower of this specimen was convinced that, whatever was wrong with the crop, it wasn't eelworm. Other plots may have eelworm but this one didn't! The description of early yellowing of foliage and progressively poorer crops rang alarm bells for me. This was just one small part of the only root that I dug up. As it happened, all the wrong things had been done. The original seed had been saved from last year's crop. The variety being grown was eelworm susceptible. The crop rotation was short and all the roots and haulms were used to make compost. Plant only certified seed potatoes. All the seed sold by FEDAGA fully meets the rigid certification requirements. Plant only those varieties that have eelworm resistance Suitable ones from FEDAGA's list give plenty of choice and are Cara, Kestrel, Lady Christl, Maris Piper, Nadine, Pentland Javelin, Picasso, Rocket and Sante. Plant the tubers later than normal. The plants will grow and mature more quickly and be harvested before all of the cysts have reached maturity. Plant only First and Second Early varieties. Again, they will be harvested before the cysts are mature. Use a crop rotation of at least four years. In this time many of the cysts will have died. At harvest time do everything possible to prevent the cysts falling into the soil by harvesting on to a plastic sheet and then totally destroy by burning, or otherwise, all the roots and haulms. On one Edinburgh site some of the plot holders wouldn't buy FEDAGA seed. They believed that their poor crop was because of poor seed. Some of them started following the rules and were very pleased with the results. If you do have an eelworm problem then I am confident that if you carefully follow, year by year, the rules then you too will be pleased with your crops as the eelworm population in your soil steadily falls.. I have seen it written that every allotment plot has eelworm and this may be not far from the truth. There is probably one exception in Edinburgh. The new site at Bridgend was pasture for many years so that any cysts that were in the soil will have died a long time ago. Help to beat the world food shortage by growing good crops of what is probably the most complete and nutritious food crop, the humble potato. There are numerous reports of people who have lived perfectly healthily when they have eaten only potatoes for months on end. They did, however, have to eat large quantities but neither lost nor gained weight.